Much of the land sitting on top of the giant underground Marcellus shale field in New York State that is targeted for gas drilling using hydrofracking is active farmland. Fracking this land has the potential to disrupt farming productivity, endanger livestock health and affect produce and livestock quality. It presents a huge danger to our food supply. Below are some of the many reasons why fracking and farming are incompatible. Acidity and Methane - Soil acidity increases in the vicinity of oil and gas pipelines where flaring occurs, reducing the amount of usable essential nutrients in the soil such as carbon, nitrogen, and phosphorous. The reduction of these nutrients makes it much more difficult for plants to grow and produce healthy vegetables and fruits. When methane, the primary component of natural gas, leaks from gas pipelines it changes the oxygen and bacterial content of the soil. This reduces a plant’s ability to fix nitrogen (the process by which nitrogen, an essential nutrient, is made available for biological purposes), create cellulose (the essential component for plant growth), and also limits a plant’s ability to maintain proper hydration. The detrimental combination of soil acidification and deoxygenation disrupts plant cell growth, which makes it difficult to grow even the hardiest crops. Heavy Metals - Fracking releases toxic heavy metals like arsenic, barium, cadmium, chromium, lead, and mercury into soils. Growing plants absorb these metals, which then enter the food chain. Humans and animals that eat these plants are exposed to these heavy metals, which can accumulate in body tissues and cause serious damage. Mercury, for example, is a highly potent neurotoxin. Eating food grown in soils contaminated with heavy metals poses a serious health risk. Radioactivity - Wastewater from fracking can contain radioactivity levels over 1000x the EPA’s recommended standard for drinking water. When wastewater is released into our streams and rivers without adequate radiation treatment, highly radioactive elements like uranium and radium, which had previously been safely trapped thousands of feet below the surface, can then enter the food chain and bioaccumulate in humans, plants, and animals just as heavy metals do. All of these toxic components introduced into the soils make their way up the food chain as plants absorb toxins, primary consuming animals eat the plants, and secondary and tertiary consumer animals eat those animals. The toxins accumulate within these animals at a rate that is faster than their livers can process, resulting in accumulation in their tissues. The toxins are then passed on to whatever animal eats that contaminated organism. Humans are not exempt from this chain. 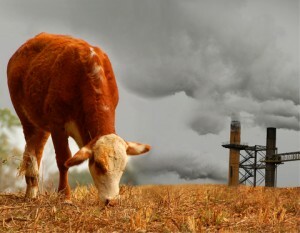 If we consume livestock that have been exposed to fracking fluid contaminated grasses and feed, we risk unhealthy exposure to the fracking fluid chemicals. Forty percent of the chemicals added to create fracking fluid are known endocrine disruptors, chemicals that interfere with the body’s natural signaling system. These chemicals can cause problems such as male and female infertility in livestock and humans. A falling reproductive rate for livestock can have serious consequences on the sustainability of food production. Heavy truck traffic from the building and running of gas wells compacts soils and creates impermeable surfaces. Compacted soil cannot be used for growing and it is difficult if not impossible for farmers to return this compacted soil to a usable form. Chemical residue from trucks is left on access roads and the runoff erodes soils and strips them of their vital nutrients. Each gas well drilled for hydrofracking requires the use of millions of gallons of water. This water is taken from nearby lakes, streams, and rivers and is then loaded with tens of thousands of pounds of toxic chemicals and sand. Unlike the water used in farming, which remains a part of the water cycle, water used for fracking fluid becomes largely irrecoverable and the risk of pumping aquifers, rivers, lakes, and streams dry is serious. Between 60-80% of the water used in fracking remains underground where it can potentially leak into and contaminate underground aquifers. The remaining 20-40% of the water returns to the surface, where it can poison nearby water sources if it is not dealt with properly. Surface water contaminated by improperly handled fracking fluids has killed many animals nationwide. Even a small spill of the highly toxic mixture can have large impacts on the surrounding livestock and wildlife. Unfortunately, animals are attracted to the saltiness of the fracking fluids, leading them to imbibe lethal quantities of the fluids and die. When access roads cut across farms or well pads are constructed within existing farm fields, productive farmland is fragmented. In addition to taking away parcels of usable farmland, fragmented farmland requires much more work to cultivate than contiguous farmland. This can mean that farmers either have to exert more effort to receive a pre-well site wage, or accept lower profits with the risk going out of business. As farms go out of business, local businesses that function to support farms also go out of business, which makes it harder for farmers who did not lease their land to continue farming. The effects of fracking are not limited to only those farmers who choose to lease their lands. When meat and produce are grown in toxic conditions, the toxic contamination doesn’t stop at the farm field. Contaminated fruits, vegetables, and meats can be shipped all over the country, potentially poisoning people hundreds or thousands of miles away from the frack source. Unfortunately, most foods are not adequately inspected for chemical contamination and residue. The Government Accountability Office has noted that the National Residue Program does not monitor all known heavy metal and chemical residues present in meat and poultry. Furthermore, since the gas companies are not required to disclose the chemicals within fracking fluid, government regulatory organizations may not even know what to test for. The danger to our food supply is just one more reason why based on extensive study and scientific evidence, Catskill Mountainkeeper has called for a ban on fracking. We are also working within the existing regulatory process in New York to raise critical issues, widen the discussion of the impacts of drilling, and expand the options available to protect the public.